This thesis investigates morphologically conditioned phonological processes in the Bemba verb in order to establish the phonological domains relevant to phonology in morphology. 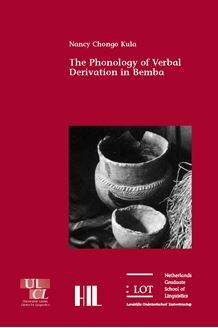 It is argued that despite the multiple morphologi­cal complexity of Bantu verbs, only two phonological domains are visible for phonological processing and parsing; the root domain and the D-(erivational) suffix domain. Evidence for this position is provided by phonological processes that are either triggered by the root (vowel harmony and nasal consonant harmony) or that only target the D-suffix domain (spirantisation and imbrication). A conse­quence of this proposal is that internal morphological brackets are invisible to phonology, and that lexical access in parsing is provided by parallel morpho­logical processing called No bracketing derivation. This thesis is of interest to phonologists interested in the phonology-morphol­ogy interface and Government Phonology, to morphologists interested in agglutinative languages and to researchers interested in Bemba and compar­ative Bantu.